Form: This statue's anatomy is considerably more realistic than earlier sculptures. The musculature is softer, and more sensuous and there is even a bit of body fat. 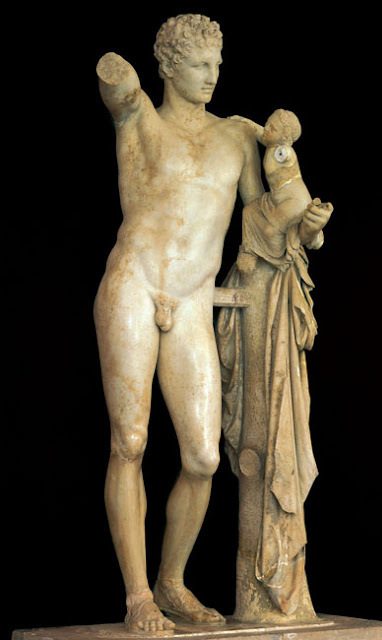 Although the statue is in contrapposto position to indicate slight movement the "S" curve of the body is heightened and the movement is more exaggerated by the arm that is held aloft. The head of the adult figure is turned towards the infant that is reaching towards the extended arm. This sculpture although still frontally oriented, is even more in the round than others. The viewer can begin to move to the far left and right to see a more interesting and complete view of the figure. 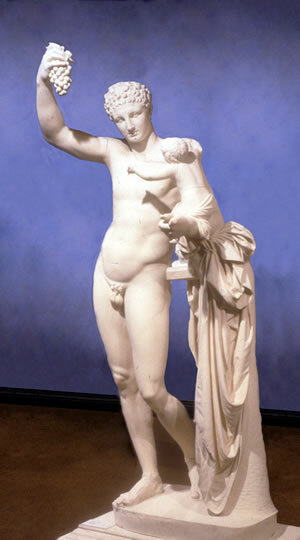 Iconography: This sculpture probably represents Hermes and Dionysus. Hermes is the wing footed messenger god who served as a temporary "nurse maid" for Dionysus in order to protect the young god from Hera. Hermes is holding out a bunch of grapes, and young Dionysos's reaching for them is prophetic symbol of Dionysos's role as the god of wine. The scene is a bit of a genre scene and probably symbolizes the more humanistic or playful attributes of the gods. Context: Stokstad asserts that this is probably a copy because of the anachronistic elements of the footwear and the fact that Romans often used braces and other elements to further support their sculptures. I believe that this sculpture is really Hellenistic because it exhibits the more dramatic and lifelike qualities of that period. This sculpture represents a break with the earlier periods in the fact that the anatomy is a bit more sensuous and realistic and that the scene is more of a dramatic and interactive moment. Stokstad (page 210) discusses the idea that Greek art around 320 BCE goes through a marked shift and begins to change into a style that stresses life-like and less general themes. 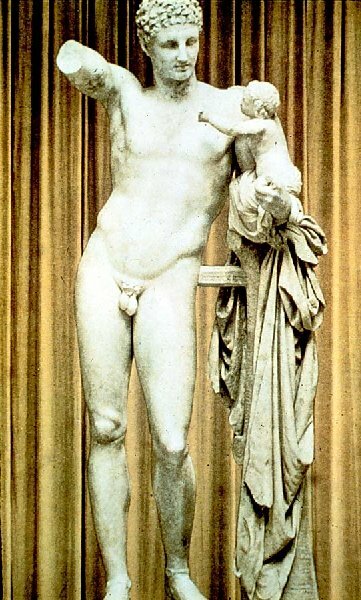 Hellenistic style art is very similar to the changes in film between the 1950 and the 1980's in the United States. If one was to think of a gangster film from the 1950's the themes, dialogue, sexual content, and violence were fairly restrained and the moral of the film would usually be that good conquers over evil or something just as high minded. Today, we have films that are much more violent, more dramatic and the higher moral them is harder to understand. The same dramatic shift happens in Greek art between the classic age and the later Hellenistic phases. 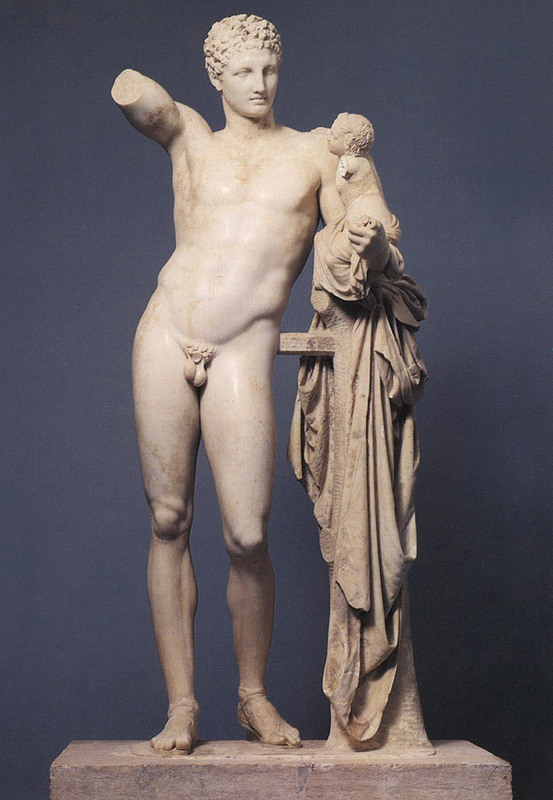 The sculpture by Praxiteles is an excellent example of this shift. It is a fine example of a transitional work of art between the two periods.